Prepare your X-Mas Rotation in MusicMaster - by Marianne Burkett – WELCOME TO OUR INTERNATIONAL SUPPORT! Ho Ho Ho… It’s Holiday Prep Time and it’s only October! Dust off the Holiday categories, it’s that time of year to spruce up the music you play between November and January 1st! If you haven’t done so yet, create your Christmas categories! Right click on the Info Bar and select “New Category”. Fill the new categories with your Christmas music. 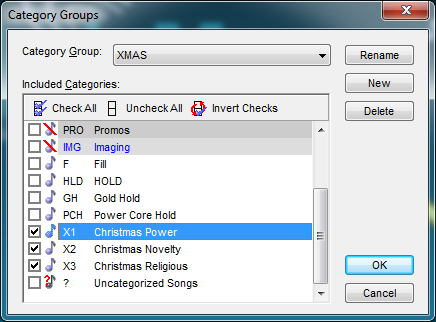 Organizing the categories nicely into a MusicMaster category group is a good way to save time with coding, analysis and rule set up. Right click on your “Info Bar” and select “Category Groups” then choose “New”. Name your Group, Select your categories and click OK.
Now that you have a group, it’s easy to check the library for duplicate Titles so you can create “Title Keywords” if needed. Check your coding and add any new songs for the year in the appropriate Categories. On to the clocks! Do you have holiday clocks from last year? Review your old clocks or make new holiday clocks. Make sure your old clocks don’t have “invalid” in the element type. That will happen if you delete a category or song card. Repair the clocks and save. Place your clocks in the holiday assignment grid and save. You don’t have to remember to change your assignment grid over. 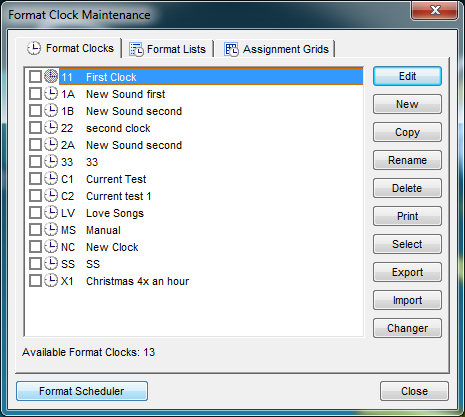 Click on the clock icon, look to the lower left hand side of the Format Clock Maintenance screen and select “Format Scheduler”. Use the calendar to select which Assignment grid you will use! This is a very basic example of what you might be able to do with your holiday clocks. Some clients go 100% Christmas, some just a few songs a day or few songs an hour. Some increase the holiday songs week by week. It’s a subjective decision. Before you tuck away your holiday set up, be sure to look over your rules for the Holiday categories. Minimum Rest; Rotation Rules; Artist and Title Keyword Rules; and any coding rules you want to incorporate should be created or reviewed.